**Access to Email Subscriptions is currently available with a Pro or Business subscription. If you would like to subscribe to Pro or Business, you can do so in your Subscription & Billing. The email subscription prompt appears directly within the comment embed and encourages engaged users to subscribe to the publisher's email list. This feature is designed to help you grow your subscription list and own the relationships with your readers so that you can share content more effectively. Visit the Admin > Settings > Email Subscriptions page and click "Enable Email Subscription Prompt" to enable the feature with the default copy that is provided. To ensure the best experience for your readers, use form fields to customize Title, Description, and Confirmation copy. We recommend that you are transparent in this copy about the types and frequency of emails that readers will receive if they opt-in. Use the toggle view logged-in and logged-out user states and click "Subscribe" to preview the confirmation message. At Admin > Settings > Email Subscriptions page to export all of your subscribed users as a pre-formatted CSV. This format can be imported into other popular email marketing providers such as Mailchimp and Constant Contact. 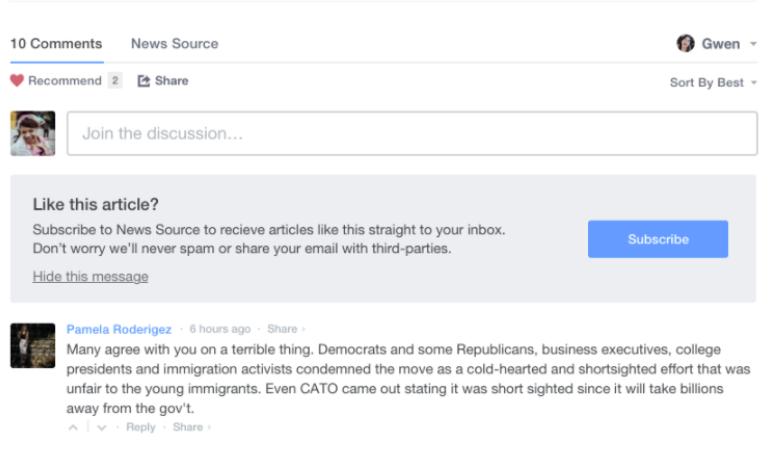 For commenters, the email subscription prompt will appear below the comment box and enables readers to seamlessly opt-in to emails from publishers. 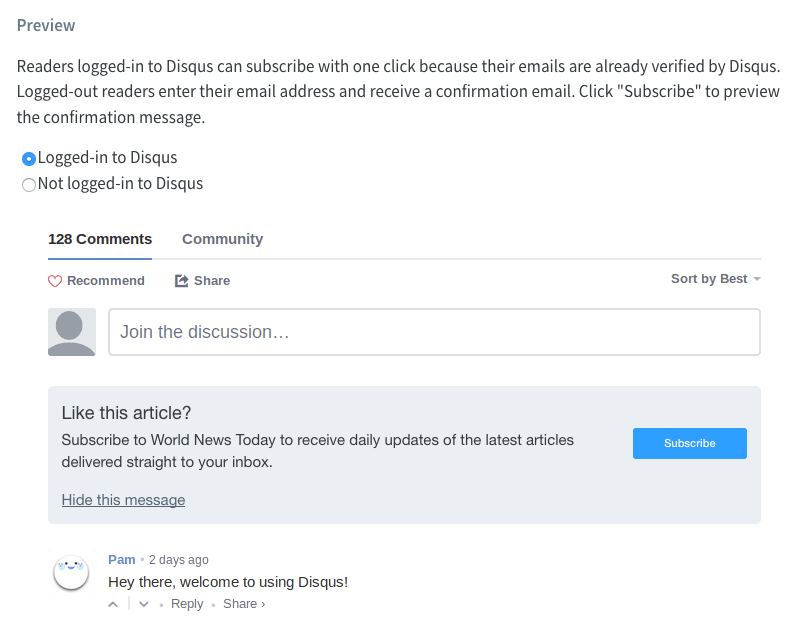 For readers that already have Disqus accounts or are logged-in using one of our social sign in options, subscribing is an easy, one-click experience. Logged out users will see a form field where they can enter an email address. To verify these email addresses and avoid spam and other fraudulent entries, Disqus will send a confirmation email to users who subscribe. Visit the Admin > Settings > Email Subscriptions page and click "Turn email prompt off". How do I export my list of email subscribers? In the Email Subscriptions settings page, you can either export a CSV of all subscribers who have ever opted-in or the newest subscribers since your last export. Does this support an email marketing service like Mailchimp or Constant Contact for automatically importing new subscribers? Check out Zapier's guide to learn how to create a Zap. If your email service is not currently supported, Zapier allows you to set up webhooks to send information to an API. What information about subscribers are available in addition to their email address? How do you verify email addresses? If user already has Disqus account, their account is already verified. If the user does not have a Disqus account, the user can enter their email address which we then send a confirmation email to in order to verify. You can customize the copy for the title, short description, and confirmation message shown in the email subscription prompt. How do my readers unsubscribe? Publishers are expected to manage the ability for subscribers to opt-out or unsubscribe from future email communications. Publishers should provide readers with relevant information about the frequency and type of emails that they will receive if they opt-in. What are the guidelines for using this feature? When using the Email Subscription feature, we expect publishers to abide by all relevant email and spam laws. This includes, but is not limited to, giving users who subscribe to email the ability to opt-out and honoring opt-outs appropriately. As previously stated, publishers should provide readers with relevant information about the frequency and type of emails that they will receive if they opt-in. In cases of abuse, we reserve the right to revoke access of this feature.